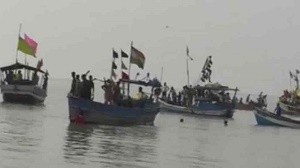 A boat carrying 30 people capsized in the Gautami river in East Godavari district of Andhra Pradesh on Saturday. While 23 people have so far been rescued, search is still on for the remaining people. Among the rescued, two were rushed to a hospital. At least seven people are said to be still missing. The boat, mostly carrying students, capsized after colliding with a pier of a bridge under construction. National Disaster Response Force and the State Disaster Response Force from Rajamahendravaram and Visakhapatnam have been deployed for the rescue operation along with police and revenue personnel. The boat was en route to Saladivari Palem from Pasuvullanka when the mishap occurred this evening. As the river was in spate, the water was swirling, making the boat movement unstable, a senior official of the State Disaster Management Department here said. It hit a pier of the bridge that is being constructed on the river and capsized, the official said. Some students in the boat climbed the base of the pier and saved themselves. Fishermen and local villagers besides bridge construction workers rescued about 20 people. According to a release from the Chief Ministers Office, rescue operation is on under the supervision of East Godavari district Collector Kartikeya Misra and Superintendent of Police Vishal Gunni. State Deputy Chief Minister (Home) N China Rajappa is monitoring the rescue operations.